Yesterday I posted a photo of Lauren and our bikes in Valencia's main park. Someone following me on Instagram sent a message. You guys are in Valencia? I live just a little ways up the coast. Will you be passing by? 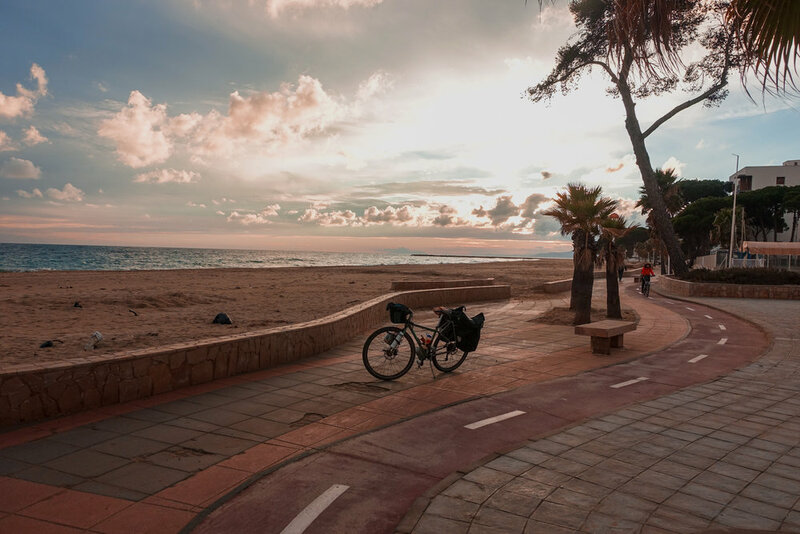 After a few confusing hours navigating the stop-and-start bike paths out of Valencia and up the Spanish coastline, we are sitting on a plush couch in Jose's apartment. Jose, who owns about twenty bicycles, is showing us plans for his latest two-wheeled creation. Jose is plenty of fun to be around. We talk about our trip and we talk bunches about bikes. We meet Jose's sister and walk to the grocery and grab a beer on the way back. We cook him dinner and share a bottle or two of wine. Jose speaks fairly decent English, and he's learned it almost exclusively from hosting travelers like us headed up or down the coast. In the morning he rides north with us. 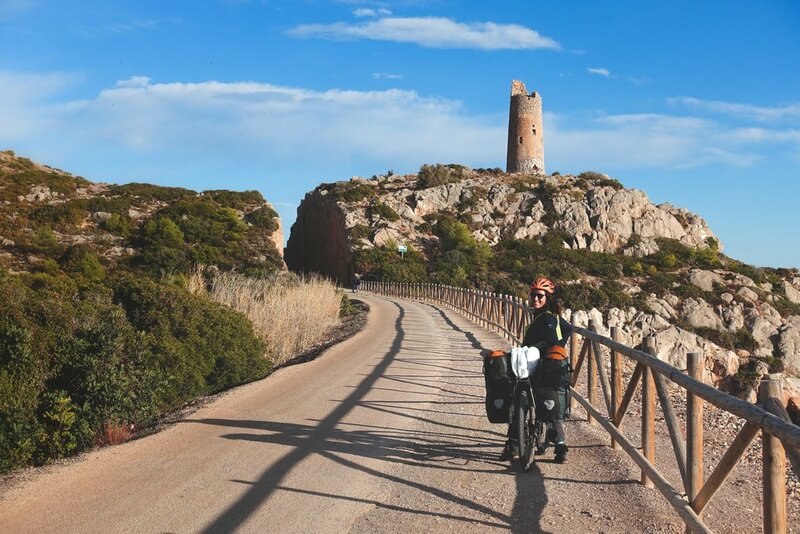 Jose knows these roads around Moncofa like few others, and he leads us on a gorgeous cycle along empty paths and rocky cliffs. We pedal together for thirty or forty kilometers, which for him would probably take an hour or two but for us and our luggage takes half a day. He's patient and rides slowly. In the late afternoon we part ways, and he hustles back home before the sun goes down. We camp in an orange grove and the next day ride through the beautiful (albeit bumpy) Serra d'Irta national park. Riding here along the coast, with deep blue skies and bright clear waters, feels like a world apart from the dreary interior whence we came just a few days earlier. It is not summer—it is not even spring—but still it's quite warm for a day in early January. Some stretches of coast, typically those too jagged to build upon, are rocky and remote and wild. Others, the flat bits, feel over-developed, a long sprawling chain of restaurants and promenades from here to the horizon. In summer, these towns must be chaos. The infrastructure—the sheer size and quantity of the hotels and parking lots and boutique shops—suggests destinations built to handle tens and hundreds of thousands of tourists. But in January it's hard to imagine such crowds. These places are ghost towns. Towns with literal tumbleweeds blowing across their streets. Hotels are shuttered and patio furniture is all stacked up inside dusty locked doors. The beaches are empty. It's almost eerie, this world without people. The strangeness of these big, empty towns is compounded by the Spanish siesta. It has taken us a few weeks to get used to passing through one pueblo at 1:30PM, finding it tranquil but marginally active, and arriving at the next pueblo down the road an hour later to discover a village that looks like it hasn't been lived in for years. It's only if we happen to pedal in around two that we'll catch workers scurrying back to their homes and merchants pulling down the heavy steel doors of their storefronts. A shadowy figure cutting across an alley on their way to lunch. The siesta is alive and well in Spain. In an ever-frenzied world all too willing to trade leisure time for more money, it's nice to see people keep this custom. Even if it does make it difficult for us to get a mid-afternoon pastry. We're somewhere on the coast and it's getting dark. We're surrounded by marshy farmland. Too dry for rice paddies, but too wet for camping. We've been cycling for an hour since twilight and we still haven't found anything suitable. There's a dirt road leading to a few modest buildings. No lights, no cars, some dry concrete on which we can pitch our tent without sinking into the earth. It's not an ideal place, but it'll do. We set up camp in a three-walled alcove outside the front door of what appears to be a disused warehouse. We're not really sure what it is. It's a place to sleep, at least. I'm woken in the middle of the night by the sound of one hard surface hitting against another hard surface nearby. Repeatedly, rhythmically. Clink, clink, clink. It's coming from outside the tent, maybe twenty centimeters from my head. Close. Half-asleep, I grab my headlamp and sit up and unzip the tent door. I shine it in the direction of the noise. It illuminates a rat the size of a butternut squash chewing on a piece of aluminum right outside the rain fly. Get out of here! I yell at the rat. The rat looks at me with black beady eyes. It is unafraid and unimpressed. It is so big. It bites down on its shard of aluminum. Clink. The rat has somehow wriggled itself into the small space between our tent and the wall. Our tent is surrounded on three sides, and the rat has made itself at home on the inside of that nook. This rat is neither timid nor worried about a speedy escape. I don't have a strong aversion to rats when I'm walking around. I don't even have a strong aversion to them if I'm lying down inside a tent. But our tent has a ton of food inside. Food that's not very well-wrapped. Food that probably smells delicious. And if this rat is hungry enough to be chewing on an aluminum can, I'm sure it's also hungry enough to trade that for whatever's inside our humble home. If its teeth are strong enough to be biting down on aluminum, I'm certain they won't have trouble cutting through the millimeter-thick rip-stop nylon of our tent walls. I don't have a strong aversion to rats. But I do have a strong aversion to a bold rat the size of a loaf of bread chewing its way into our tent while we sleep. I don't tell Lauren how big the rat is. I just tell her we need to move the tent. She doesn't think it's necessary, so then I tell her how big the rat is. She agrees to move the tent. I try to scare the rat away but it doesn't scare easily. I finally shoo it to the open end of the alcove, so it can't get backed into a corner and won't do anything rash. Lauren and I exit the tent, lift the entire thing into the air, and carry it five meters away to more open pastures. We drop it down into the mud. The rat doesn't return. We sleep better than we should, given the circumstances. We sleep so well that we don't hear a car pull up and park just a few meters away, in the exact spot our tent was pitched before the rat scared us into the mud. Good thing there was a rat after all, I guess. The driver of the vehicle, and incidentally the holder of this land, greets us when we exit our tent in the morning. He isn't mad we're here. He's actually very friendly. He asks if we need anything. He fills our water bottles and insists on taking our trash so we don't have to carry it to the next dumpster down the road. He asks us a little about our trip and wishes us a safe journey as we pull away. It's another pleasant day of cycling along beautiful coastline and quiet bike paths. In the evening we stay with Francesc, a Couchsurfing host, and share a wonderful time over dinner and wine. Come morning, onwards. We're just a few days from Barcelona now. We ride all day. 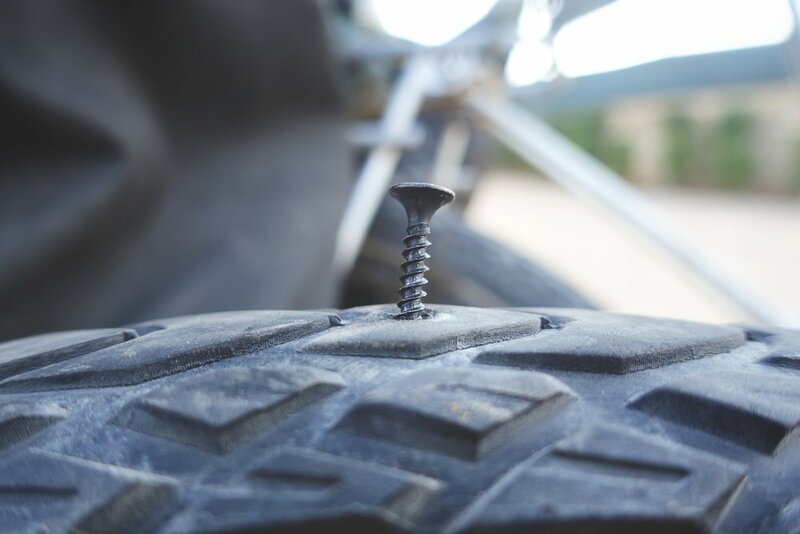 In the late afternoon, Lauren runs over a screw that lodges itself deep into her tire. Her tube punctures, and we work quickly to fix it before dark. We remove the tire, pull out the screw, and switch out the tube. We reseat the tire, inflate the new tube, and carry on. One kilometer later, Lauren's tire is going flat again. We stop along the coast. The sun is sinking toward the horizon, and we have another twenty kilometers to Casteldeffels, where our next Couchsurfing host, Javier, is waiting for us. We've been enjoying our Couchsurfing and Warmshowers stays a whole lot—not just for the soft bed, but for the really excellent company, for the opportunity to connect more intimately with Spain and its people—but traveling in this way gives us a lot less flexibility than we're used to. We now have places to be. We need to get this flat fixed, and quick. I push down on the valve to let the rest of the air out of Lauren's back tire. Nothing happens. There is air inside the tire, but it is not coming out. There's something wrong with the valve. We have never seen this before. This is a problem because without releasing the air in the tire, we cannot get the tire off. We cannot change the tube because we cannot reach the tube. The sun retreats behind the mountains and the sky glows violet. A safety pin is sitting on a nearby ledge. I think for a moment. We need less air in this tube. The valve will not release air. There are other ways for a tube to release air. I pick up the safety pin and begin stabbing it into Lauren's tire to induce a puncture. It sinks into the rubber. But these are strong tires, and this is a very weak safety pin. It can hardly pierce the treads. I ask Lauren for her knife. I manage to pry up just enough of the tire from the rim to catch sight of a sliver of the inflated tube, wriggling underneath like a slug, and I drive the knife into its side. It hisses back and shrivels to nothing. Ten minutes later we're back on the road. It's now dark. Regrettably, we still have not replaced the rear lights we had stolen way, way back in Malawi. We really need to do that. The twenty kilometers that separate us from Casteldeffels are unlike the past several hundred kilometers we've ridden the past few days. These twenty kilometers are steep and winding and navigated along rocky cliffs hundreds of meters above the sea through a narrow two-lane road with no shoulder and no streetlights. It is not a nice place to be at night, on a bicycle with no rear LEDs. Traffic is horrendous. We put our headlamps on and twist them around to the back of our heads. They are dim and do very little to illuminate us. Thankfully, we are bathed in the florescent glare of one passing car's headlights after another, and so we are not altogether invisible. But we do not feel comfortable on this road. It's worth noting that Spanish drivers are truly wonderful. Other than the two folks that slowly crashed into me back in Ceuta, we have been in this country for nearly a month and been honked at maybe once or twice. On the Spanish mainland, we have seen zero instances of road rage. Drivers yield to cyclists and they pass with a wide berth. And even here, riding this mountainous road at night without rear lights, no one is having a fit in their driver's seat. The cars behind us are moving slowly and overtaking only when it's safe to do so. People are patient. As Americans who have spent years cycling in America, it all feels very ... foreign. Pleasant, given the circumstances. Anyway, we arrive in Casteldeffels safely. We find Javier's flat and carry our bikes upstairs and chat a little and make dinner and sleep. And the next morning we set out for Barcelona. If there's a northbound way into Barcelona other than the highway, we sure don't know it. It is 8AM and we are in rush hour traffic on the autopista. It is a proper highway, with several lanes and exit ramps and big blue signs and massive concrete pylons supporting the whole thing from underneath. We know that we are not allowed to be here. And yet, there doesn't seem to be any other way. We've taken access roads and service corridors as far as we can into the city, but at some point all avenues converge into this one for the final four kilometers to Barcelona. It doesn't actually feel unsafe. It's markedly better than the road to Casteldeffels last night. For one, it's light out. Also, there is a nice shoulder. Additionally, there's just the right amount of traffic where nothing is really moving. We are the fastest things on the road. If we weren't suspended forty meters in the air on a very unnatural-looking cement viaduct with no intersections or stoplights, this is roughly what cycling in the middle of a city would be like. It doesn't feel unsafe. It just feels illegal. A woman on a scooter pulls up next to Lauren and calls over that we're not allowed to be here. A man in a white sedan catches my eye and wags his finger. Tsk-tsk-tsk. I shrug. Do you know of another way? We would be all too happy to take another way. We're not worried about collisions on this slow-moving road, just cops. Fortunately, we reach the first exit ramp inside the city before we see any. We descend into Barcelona. It has been over six months since we have been anywhere familiar. Anywhere we have been before. Since leaving Cape Town, every place we have been has been a new place. If not a new country, then a new place within an old, familiar country. We are by now well-used to the novel feeling of not knowing our way. And, too, it has been six months since we have seen anyone familiar. With the sole exception of an old childhood friend I hadn't seen in fifteen years and was lucky enough to catch up with briefly in Lusaka, we have not, since leaving Washington last July, seen a single person we knew before leaving Washington last July. So it's an odd, homecoming-sort-of-feeling to return to Barcelona (my first time in three years; Lauren's first time in nine), navigate to the Gothic Quarter with less reliance on maps than actual experiential memory, and just moments later see our great friend Molly, fresh off a plane from DC, waiting for us. There are shouts, and there are hugs, and there are joyous tears. This little reunion has been in the works for months. Our friends Tiffany and Justin knew they'd be in Spain at some point this winter. We knew we'd be in Spain at some point this winter, too, or at least we figured we might be. Justin was coming for work, and Tiffany was coming along, so they thought they'd make it something of a vacation. Way back in Zambia or Malawi, they'd sent us their dates. We tentatively planned to meet them somewhere. Portugal, Madrid, Barcelona, anywhere on their itinerary. We're pretty flexible, and it'd be really great to see them. We rode to Tanzania. We bought flights to Morocco. We cycled north. Molly called one day and floated the idea of coming along, too. The more the merrier. Molly booked a flight to Barcelona. Things solidified. Molly would arrive the fifteenth, and Tiff and Justin would get in from work in Madrid on the seventeenth, and we'd all enjoy five or six lovely days together before they'd fly home and we'd pedal on toward France. Things happened, of course. Snow and sickness and prolonged stays in Algeciras and Jaén. We got slowed down. Ordinarily that doesn't matter. Ordinarily we have no place to be. In this case, we had somewhere to be. So we caught a bus (barely) and arrived in Valencia and made quick progress up Spain's Mediterranean coast. And now we are here. With Molly. And soon, with Tiffany and Justin. We've booked a hostel for our first three nights. A small, private room with three skinny little beds. We carry our bikes up way too many flights of way too narrow stairs, cram them into the corner of the room, and fill all the remaining floor space with our luggage. We spend the next few hours—and few days—catching up with Molly. We walk around the compact Gothic Quarter and ramble on La Rambla and have picnics in the park. We eat tapas and catch Francesc (our host back in Salou) for pizza and make numerous visits to a hole-in-the-wall Italian joint selling focaccias the size of your face for a euro. We start a small collection of empty wine bottles underneath the sink in our room. A few days later, Tiffany and Justin arrive. They're staying a few kilometers away, and we head over to their hotel balcony for hearty hellos and happy hugs and a long, lovely night sampling the tapas and cervezas of Barcelona. A day passes, then another. More talking, more tapas. Strolls to Park Guell and through winding alleyways that spill out into wide, regal plazas with grand, ornate cathedrals. Lazy, pleasant afternoons. We take a walking tour of Barcelona and learn some of its fascinating history. More than anything, we just enjoy the short time we have with some great friends. Great friends that do some really nice things. Like make room in their suitcases for a small stash of imports from America to replace a little of our flagging gear. It's a bit like second Christmas, when Molly arrives, handing us a bundle of goods we'd had delivered to her place back in DC. New buffs, a few electronics, a fancy new windscreen for our stove. When Tiff and Justin show up, it's third Christmas. They come bearing beanies, bags, and a whole new cookset to replace the one sorry frying pan without a lid or a handle that we've been cooking with since Zambia. After our first three nights in Barcelona, Molly, Lauren, and I relocate to the rooftop studio of Jordan, perhaps Barcelona's coolest Couchsurfing host. A few years back, Jordan and a friend rode his old, secondhand motorcycle from India back to Spain, snaking for months through central Asia and eastern Europe on a bike that couldn't go much faster than fifty kilometers per hour. We didn't want to leave Barcelona without meeting Jordan and picking his brain, and he's kind enough to put the three of us up for our last three days in the city. We spend a night or two cooking big Indian meals with Jordan in his cozy, rustic kitchen. Tiff and Justin come over for wine. In the mornings we drink tea and talk about the culture of Kazakhstan and the visa difficulties of Uzbekistan and the best way to fold a sleeping pad for space-efficient travel. Jordan is planning another motorcycle trip to southern Africa, and we share our knowledge of the backroads of Namibia and Botswana. We meet Jordan's girlfriend and a few of his friends. We have plenty of laughs. It's been a fantastic week in Barcelona. We've seen some old friends and met some new ones. We've stayed in one place for longer than anywhere since Dar es Salaam, and we're feeling relaxed and rejuvenated. And sad, of course. It is Saturday, and in the morning our three dear friends are headed to the airport. By evening they'll be back in their beds in America, a return journey that, for us, may take another three years. We don't know when we'll next see them again. We don't know when we'll next see anyone again. We say goodbye to Tiffany and Justin, and later to Molly. Our friends fly west, across the Atlantic. Toward the Americas. We turn east. We turn toward Asia.